The Full Shell Walker 2 boot by DeRoyal comes with a unique air compression system that allows built in medial and lateral air pumps to provide customized compression around the leg, ankle and foot. These air bladders can cushion around swelling or bulky dressings and the foot bed of the boot is wide enough to accommodate a variety of foot shapes. The bottom of the boot is curved to move with the wearer's natural gait and has a tread that provides increased friction for grip and shock absorption. The boot is secured with an easy loop and hook system that can be fastened in just a few moment and additional pads are included with the boot that can provide extra comfort wherever necessary. Wash soft goods with mild detergent in lukewarm water. Air dry. Patients with poor peripheral circulation, diabetes, or decreased skin sensitivity should not use this product. Do you have pictures as to how you wear it on your foot? Instructions for use have been added to the product page for reference. Photos were not made available by the manufacturer. This is a very good quality, comfortable boot if you have to be in one. 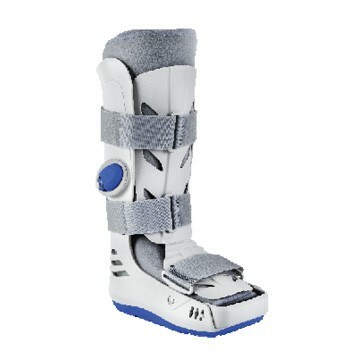 But my review is more for Vitality Medical than for the boot itself... when my doctor prescribed this boot, his office was going to charge me about *4 times* the amount that I paid here at Vitality Medical, plus they shipped extremely fast & the whole experience was a real pleasure & a breath of fresh air... so glad that I found them! Don't hesitate, just order it here..